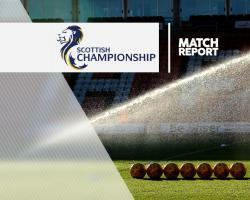 Hibernian maintained their 10-point lead at the top of the Scottish Championship after a goalless stalemate at home to Morton, whose point moved them above Falkirk to second in the table. John McGinn and later Brian Graham went close with headers before Jason Cummings and Darren McGregor were denied by goalkeeper Derek Gaston. Both teams finished the game with 10 men after McGregor, for violent conduct, and Morton's Kudus Oyenuga were sent off in injury time. Hibs have six games remaining as they look to win promotion back to the top flight after a three-season absence.